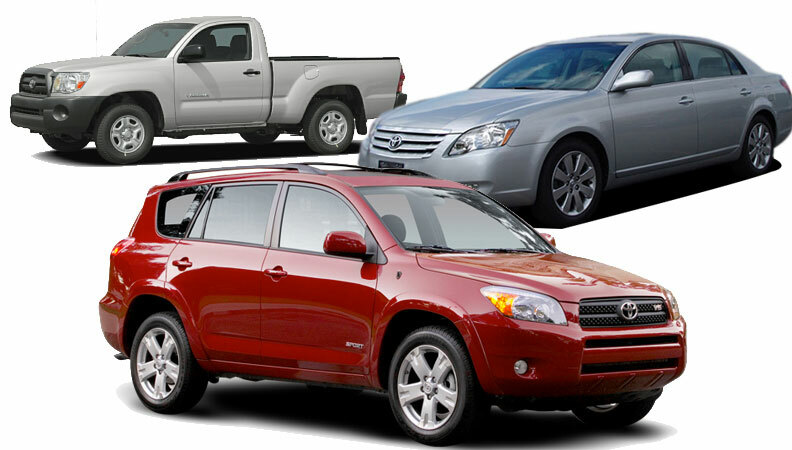 Toyota car and truck transmission repair and rebuilt transmissions. The Toyota is a well made vehicle but needed repairs to the transmission of some of their cars and trucks are a common problem. The Toyota Camry gears will become hard to shift over time on earlier models due to the check balls moving out of place. Gasket leaks, like many other models are a reoccurring issue so be sure to have your transmission maintained periodically according to the manufacturers specifications and schedules. The 1990 - 2007 model Camrys with automatic transmissions that come into our shop have had issues with the throttle position sensor and the shift solenoid. These are common repairs that do not require a rebuilt transmission. The Toyota Avalons that come into our transmission repair shops in North Fort Lauderdale, Tamarac and Sunrise have gear slipping problems. This is due to several different problems within the transmission and each case needs to be diagnosed on an individual basis. The Toyota Tacoma pick up truck's manual transmission has had problems popping out of gear which is due to a worn out shift lever seat which is a minor repair and there is no need to panic about cost. Low fluid levels are all too common with any car or truck but the Tacoma's 4WD transmissions are particularly susceptible to this problem. This is because the front and rear seals break down over time. Low fluid levels cause a strain on the engine and the the shifting becomes labored causing a grinding sound. Check your Toyota specified GL4 or GL5 transmission fluid regularly to make sure you are not leaking fluid. Often leaking fluid occurs when you are driving so you may not notice drops on the garage floor. Bring the Toyota Tacoma into our shop so we can change the gaskets, perform a complete transmission fluid flush and put new fluid in. The flush we perform forces out al of the old fluids so the casing is clean of any debris or old fluid. The Toyota RAV 4 transmission repairs have mostly centered around the Power Control Module, ECM or computer related problems. This controls the transmission's operation and when it becomes faulty your transmission will not shift smoothly. The solenoids in the transmission are not given the correct signals to function properly. This puts a lot of stress on the engine and the transmission which will burn our the clutches. This transmission repair job is rather easy and can save your car from having a total rebuild which would occur if left to go unprepared. If you own any type of Toyota automobile you are well served at The Fort Lauderdale Transmission Repair Shop in North Ft. Lauderdale on 441 near Tamarac and Sunrise. Our experienced technicians are well trained at repairing all Toyota models and undergo constant retraining and further eduction to stay on top of the factory's new specifications and repair procedures.